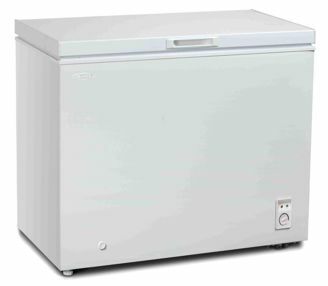 The Chest Freezer from Danby will be the best addition to your place. The unit features R600a Refrigerant, Manual Defrost, and Mechanical Thermostat. Modern, Compact Chest Freezer If you’re on the lookout for a modern, compact chest freezer your search can end here. Mechanical Thermostat The mechanical thermostat is mounted on the front of the unit for easy accessibility and the drain is also front-mounted, making the defrosting process quick and easy. Storage Basket The unit features a storage basket at the top for smaller and more frequently used items. Smooth-back Construction The freezer is designed to fit flush against the wall with its smooth-back construction.